SCVHistory.com OX1001 | Saugus | K-8 Saugus School, 1910. 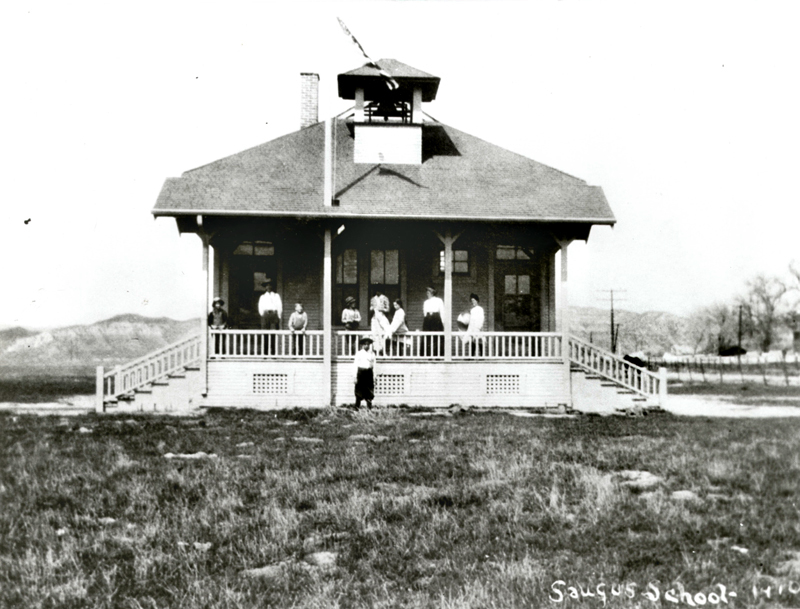 Saugus Elementary School opened in 1910 on a section of Charles and Anita Kellogg's farm, located in the "triangle" between present-day Magic Mountain Parkway, Bouquet Canyon Road and Valencia Boulevard. Three Saugus businessmen (Saugus Cafe co-owner Martin Wood, Saugus grocer Ore Bercaw and someone named Osborn) contributed $100 each for the construction of the wooden, New England-style building. Unlike other Saugus buildings that faced east (toward Bouquet Canyon Road), the original schoolhouse faced south. Margaret O'Connell was the first teacher. On Nov. 12, 1908, the Saugus School District was formed from sections of the Newhall School District (est. 1879) and Castaic School District (1889). The school construction project was put to bid a year later, on or about Oct. 15, 1909. After initial construction, the little 26x50-foot, one-story wooden schoolhouse was added onto as the school population grew — which it did, thanks in part to a 1911 state law whereby school districts were no longer funded based on area population, but by the number of kids who actually attended class. Now, school officials had a real incentive to get them there. By 1935 the school district was in need of more money so it asked voters for an extra $1,500 per year. They said no, 7 votes to 6. Unphased, the school board put together a plan for a new, modern school to replace the antiquated schoolhouse. This time, on Nov. 14, 1935, voters said yes to a $22,000 construction bond measure. Coupled with a $17,181 grant from the New Deal-era Works Project Administration in early 1936, the district spent $34,913 on a brand-new Saugus School. Two years later, on Oct. 28, 1938, the district reorganized as the Clifton Union School District, swallowing up all or parts of neighboring districts. On Feb 27, 1940, it changed its name to Saugus Union School District. District boundaries were adjusted again in 1951 and a portion was transferred to the Sulphur Springs Union School District in Canyon Country. The Saugus District built its second school in 1960 and gave it the same name as the housing development in Seco Canyon where it was located: "Santa Clarita." Then came Jerome Snyder School, which was temporary, followed by Honby in 1963. (Honby School was transferred in 1991 to the Sulphur Springs District and renamed Canyon Springs.) From there, campus contsruction moved at a fever pace. But the original Saugus School site's days as a learning facility were numbered. It closed after the 1977-78 school year because the population of Saugus had shifted north of Bouquet Junction and the location was no longer practical as a school site. Additionally, old timers remember the foul air that wafted over the campus from the Keysor-Century Records plant across the street, raising health concerns. Purchased in 1978 by a private developer, the buildings were remodeled and expanded into the aptly named Saugus Schoolhouse Emporium, a shopping center. By order of the school board on Aug. 2, 1978, its bell (whose authenticity as the original 1908 bell has been questioned) was placed in the "custodial care" of the Santa Clarita Valley Historical Society with the intent that it be placed in the Felton School at Mentryville "until such time as a possible permanent location should be found." In 2000 the Historical Society placed it on permanent loan to the city of Santa Clarita for the bell tower of the Newhall Metrolink Station, where it hangs today. 1. Minutes of SUSD Governing Board Meeting of Aug. 2, 1978, regarding the Saugus School bell: "On motion of Mrs. Lund, second of Mr. White, and a unanimous vote, authorization was given to place the Saugus School bell in the custodial care of the Santa Clarita Valley Historical Society, to be housed at the restored Mentryville School site in Pico Canyon in Newhall until such time as a possible permanent location should be found."